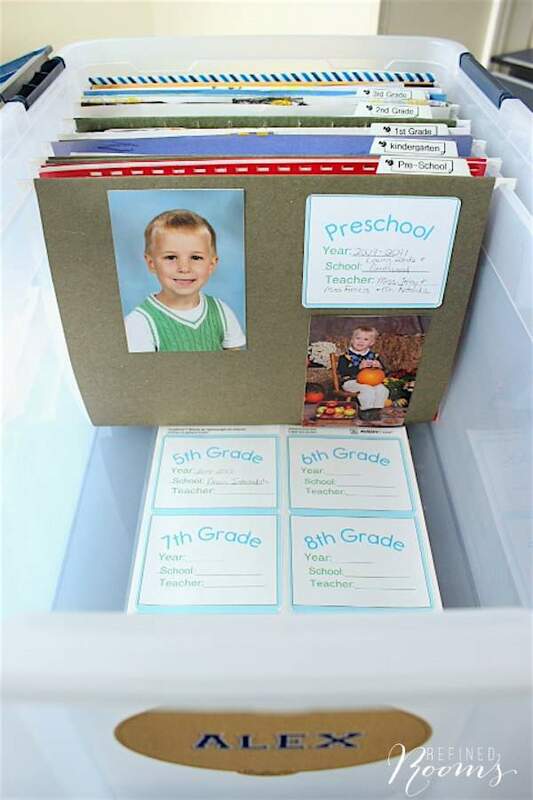 First, purchase a portable file box for each child (this 12-gallon Flip Top File Box is the perfect size), a box of hanging files/tabs, and some shipping labels (I recommend Avery 3.33 x 4″ labels). 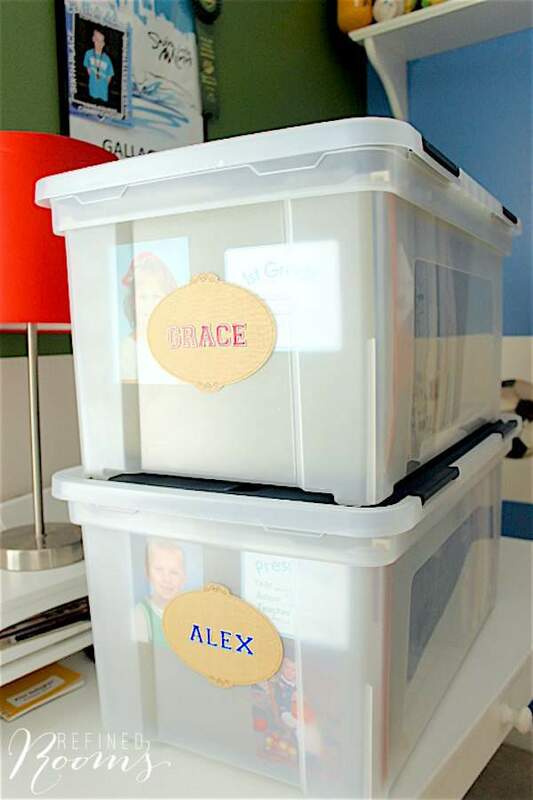 You’ll need 14 folders/tabs/labels per child. 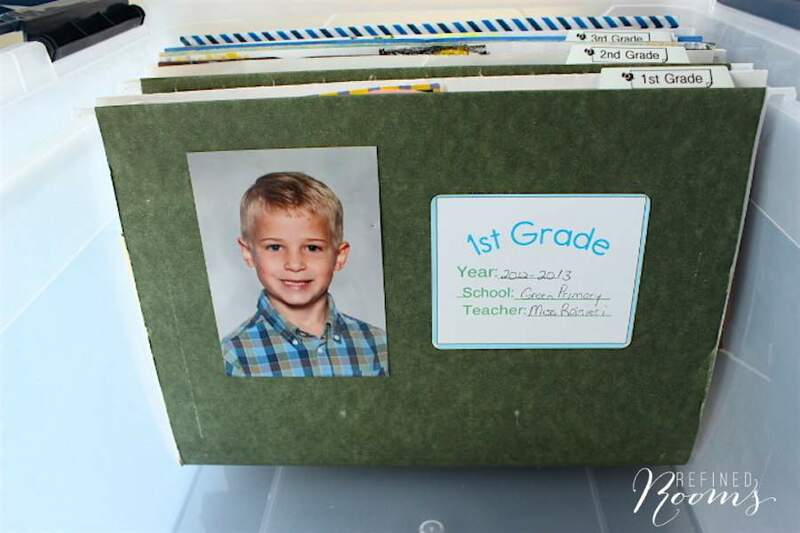 Designate a file folder for each school year (including preschool and kindergarten) using the clear file folder tabs to label each folder (this is where a label maker comes in handy!). In addition, attach a label to the front of each folder that provides a bit more detail regarding each school year. For example, I chose to include the year(s), school, and teacher(s) for that particular grade. I also like to attach a school picture to the front of each folder…cute, eh? 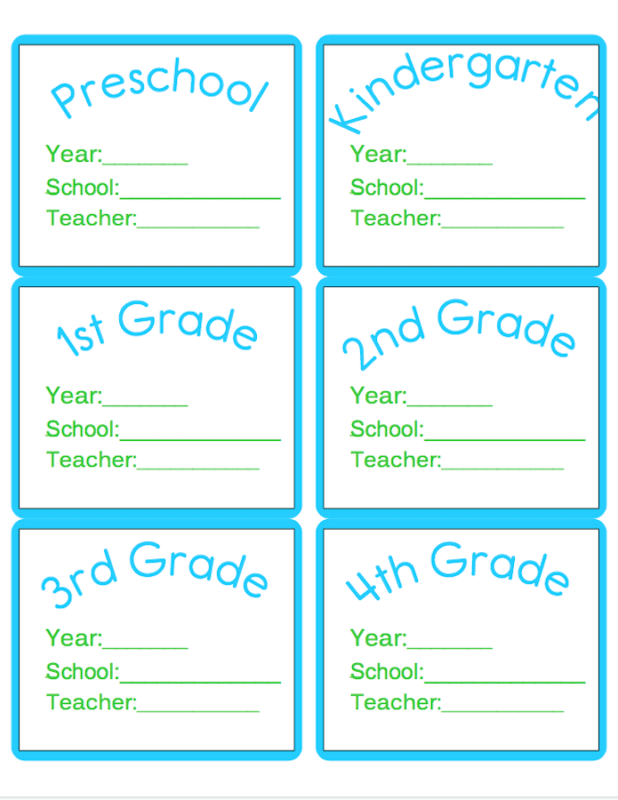 I recommend creating and printing all 14 labels at one time, even if your little cutie is only a preschooler this year. That way, you’ll have consistent labels across the folders and won’t have to worry about trying to recreate the labels if your digital file somehow gets misplaced in future years. As you can see below, my label sheets for future grades are all ready to go for my 3rd grader. Below, I’ve shared some examples of the types of things that can live in the memorabilia folders. For example, my daughter’s 4th grade folder contains key projects for that grade, papers that represent proud accomplishments (e.g., finally passing the timed test for division! 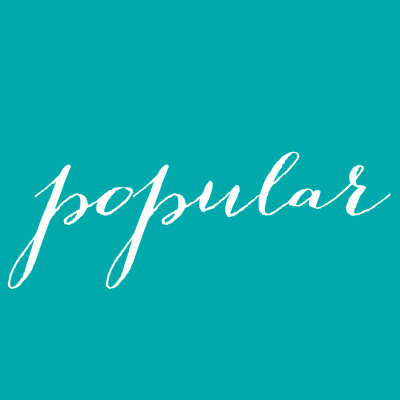 ), programs for school-related events, and assignments that reflect her current thinking and interests. You can choose to include other non-school memorabilia items accumulated during the year as well, which is what I’ve chosen to do. 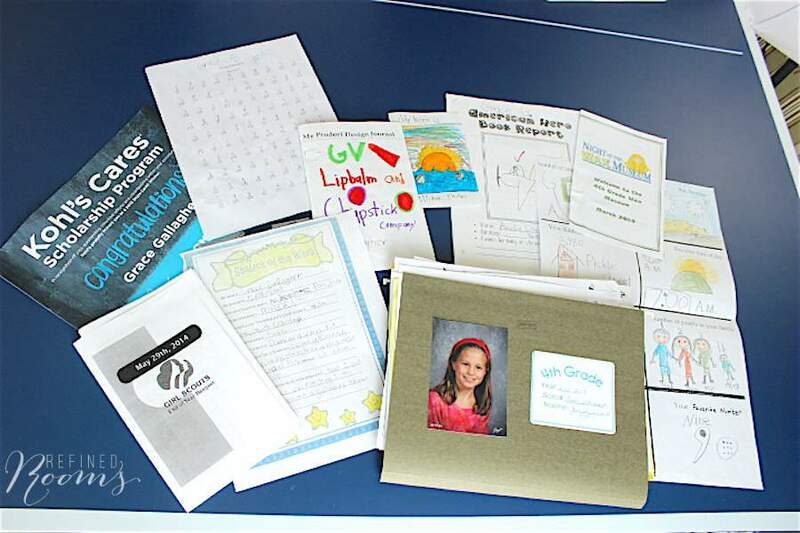 For example, my daughter’s swim team ribbons and Girl Scout memorabilia are contained in these folders as well. Depending on how selective you are when it comes to holding onto your child’s art work, you can choose to include a few key pieces of art in the folders as well. I generally recommend a separate method for organizing and storing art. The beauty of this system is that it puts a limit on what you can keep. This process serves as a great example of using what we call in the organizing biz a “self-limiting container“. By choosing this container, I’ve set a limit on what is an acceptable amount of “real estate” for school memorabilia to occupy in my home. This volume is what feels comfortable for me. You may be willing to accept a much larger real estate footprint in your home if you have a hard time parting with sentimental items OR you have a really large home. 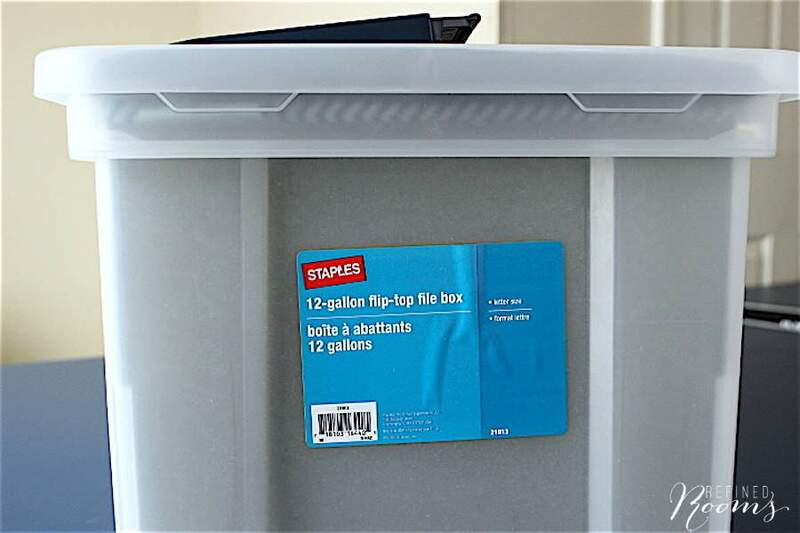 If you’re a person who saves the equivalent of one of these boxes for each of your child’s school years, keep in mind it’s pretty unlikely that your adult children is going to be interested in hauling off a massive collection of childhood memorabilia when they reach young adulthood. I’ve witnessed this situation with several of my clients! 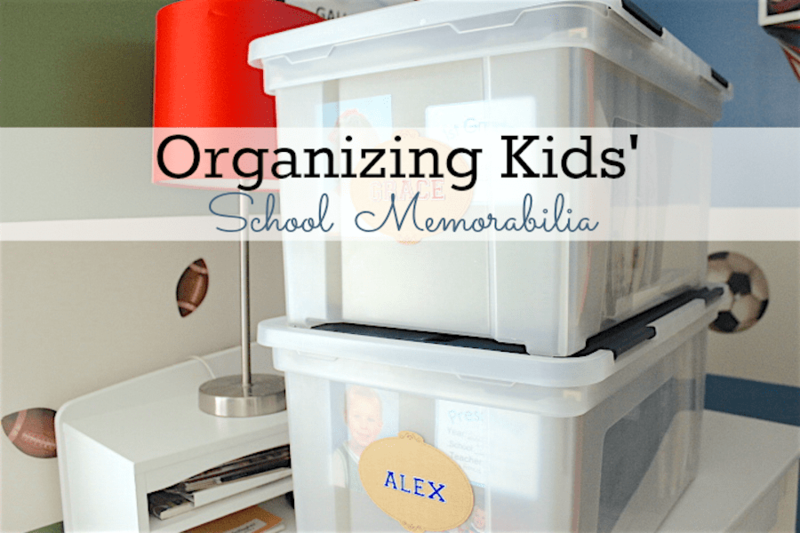 Make it simple for you and your kids to enjoy their school memorabilia by whittling these items down to a manageable collection that represents the most treasured memories and proudest accomplishments of each year. 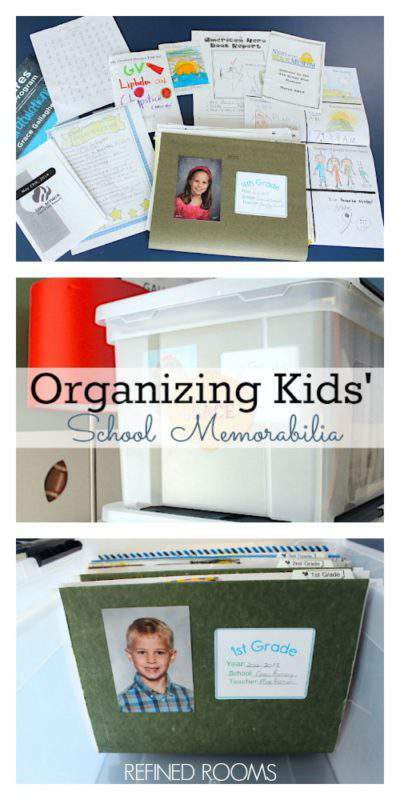 Do you have a system for organizing school papers/memorabilia that works really well for you? I’d love for you to share it below! hi Im am getting ready to do the kids origination BOX. I am beginning the process of putting boxes together for my 2 daughters. May I ask where you got your name stickers? Awesome Kelly! Those were custom-made with scrapbooking materials from Joanne’s or Michaels. Probably not helpful to you. Sorry!